Naturally, a lot of this stuff is available on the secondary market, and not necessarily all that expensive. But there’s nothing quite like being able to get something fresh and new, hence our desire to see some enterprising company pick up the baton on these. 13. Topps Batman photo cards. Abrams ComicArts has published hardcover books highlighting Topps’ Star Trek (click here), Star Wars (click here) and Planet of the Apes (click here) bubble-gum cards. 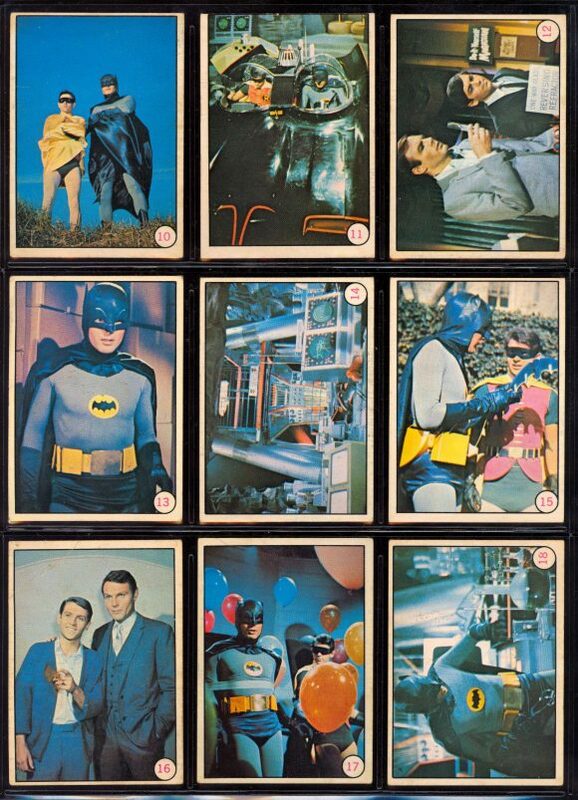 It would great to see the Batman photo series cards represented too — or as a reprint card set! The artwork cards that came out around the same time are fantastic, but they have been rereleased in various formats over the years. Bring back the Bat Laffs cards! From eBay, like most of these photos. 12. 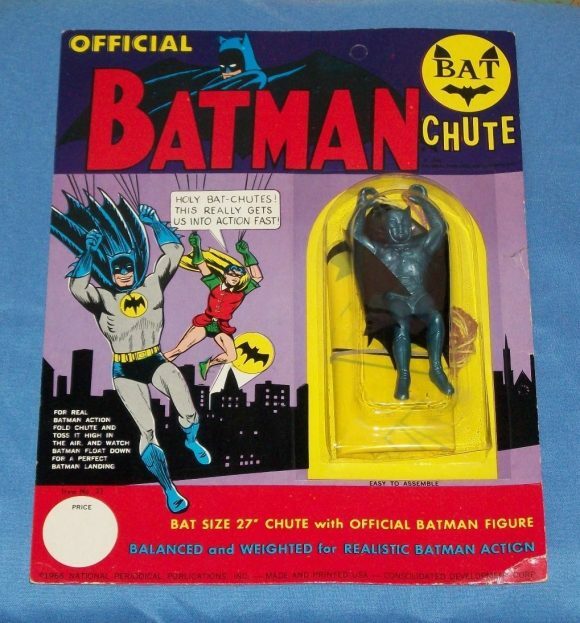 Batman parachute figure. This I first saw in a discount store called Zellers in Grimsby, Ontario. It was on an aisle peg-rack display in the early ’70s. For me it is one of the perfect collectibles, with its great mid-’60s logo at the top and printed on the parachute. (There were variations, with red and, I think, green plastic parachutes. Mine was the yellow one.) Also I thought it cool that the figure had the Bat logo without the circle around it. 11. 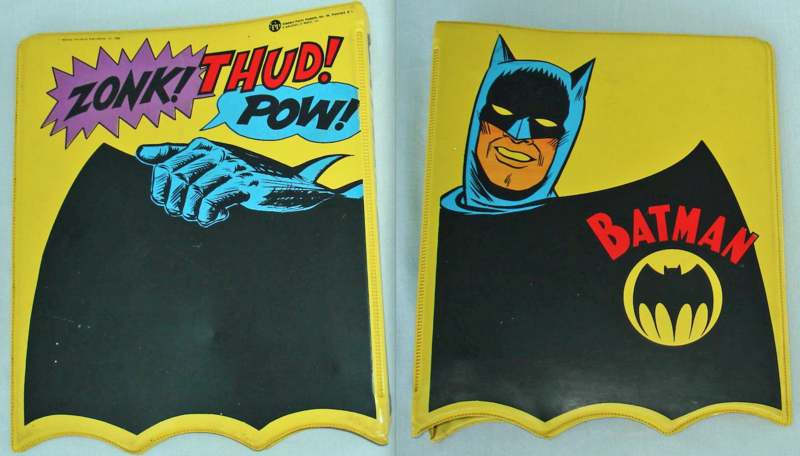 1966 Batman three-ring binder. I remember seeing kids with this at school and I thought it was so cool. The scallops on the bottom — and the design entire design of it. There was kind of a variation of it in the early ’90s based on the Bruce Timm animated series. 9. Ben Cooper costume/mask. Ben Cooper is sort of going through a resurrection these days, and acknowledging its licensing past too. I hope they find a way to rerelease this not as a kids’ costume but maybe as a Figures Toy Company figure or an adult onesie! 8. 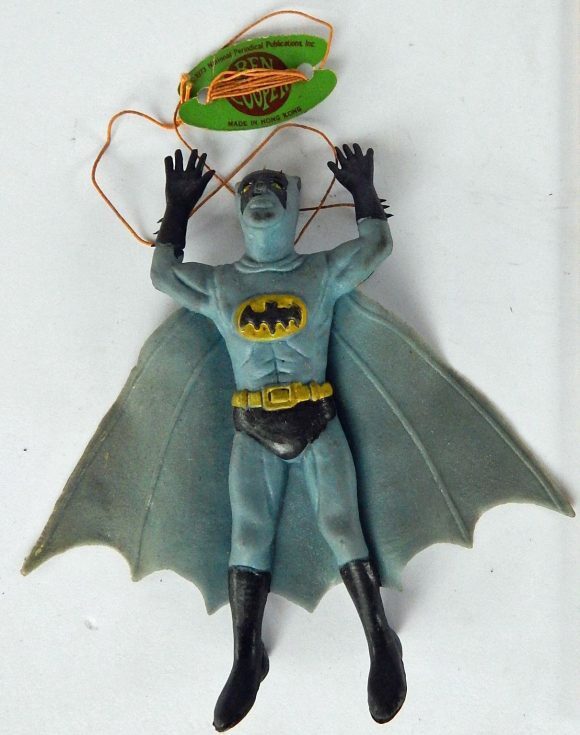 Ben Cooper rubber Batman figure on a string. Yeah, it’s cheap looking and odd but I just love it for what it is. Again, a favourite as a kid but lost to time. I found it again at a comic convention in the mid-’90s. 6. 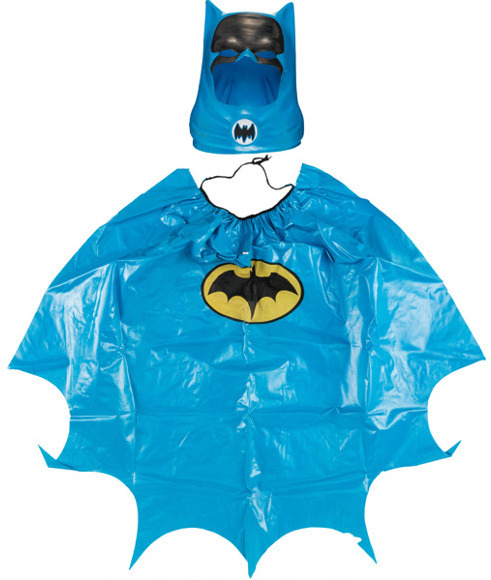 Ideal cape and cowl. The cowl is a great display piece. You can get them reasonably on auction sites if you look. Box design is great too. 5. Batman Pez with cape. The 1966 Batman Pez head pretty much was unchanged for multiple releases all over the world up until the mid ’90s. But the Holy Grail is the figure with the cape. I’m actually surprised this hasn’t popped up as a bobble-head or large bank. 4. 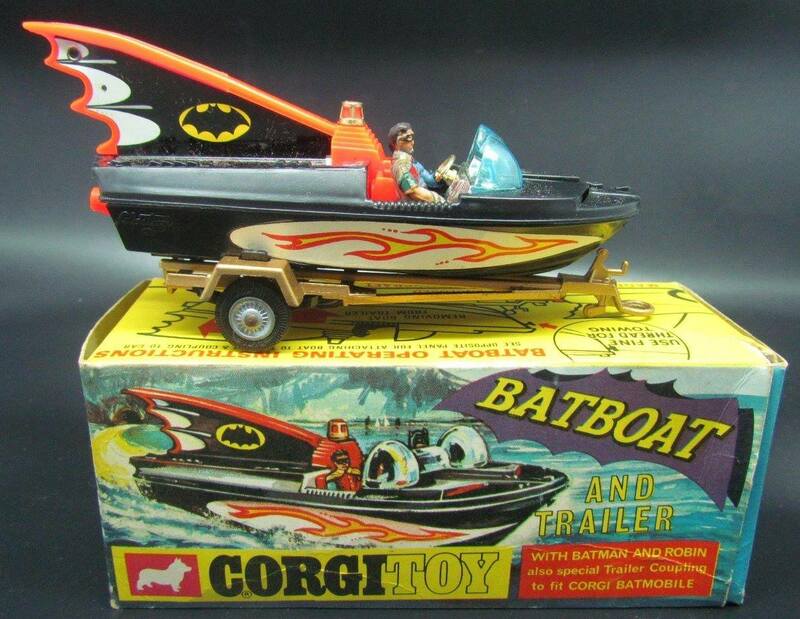 Corgi 1966 Batboat. The one with the black metal tail fin and mini Batman and Robin figures. I think I went through several them as a kid. It went in the backyard pool and floated no problem. The original Corgi release was the best with the trailer. 3. 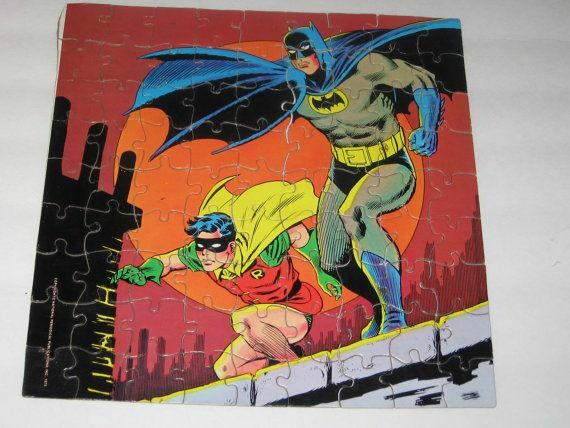 Colorforms Batman kit. Dan covered this one, as well. Colorforms has been saluting its past, with re-releases including Snoopy Come Home and the original generic set. Can the classic Batman kit be far behind? 2. 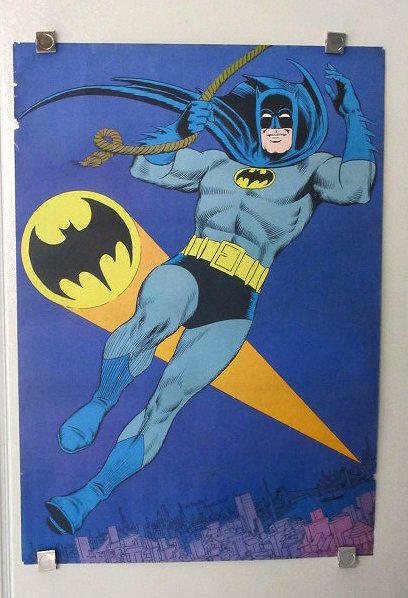 1973 Carmine Infantino Batman poster. I had this poster for years in my room as a kid and it was lost to time. The Infantino/Anderson artwork is classic against a purple background with the Batsignal in the sky. 1. 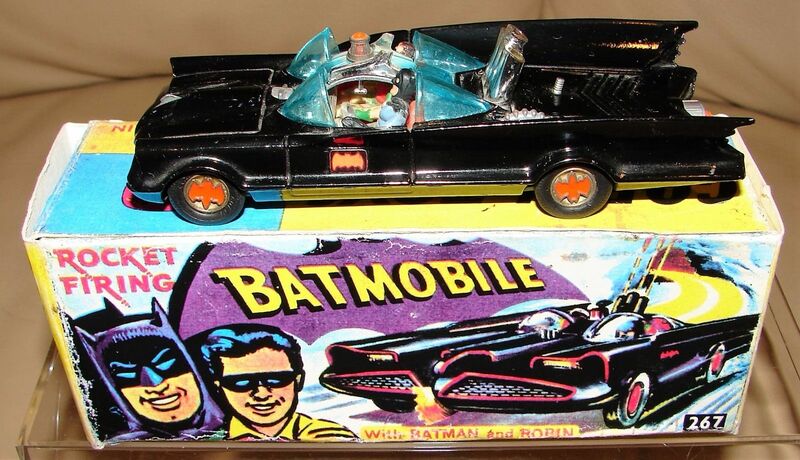 Corgi 1966 Batmobile. The original release, with the cool box graphics. The Bat-wheels with the “fire” moving in and out of the back by the trailer hitch. The firing rockets, the chain cutter. Infantino Batman figure on the bottom. A classic for every Bat-fan! Nailed it. I still have some of those. Sweet list! I don’t think I’ve ever seen some of these. I still have my 1966 Batcave with some of the little figures like Thunderbolt (odd as he was Justice Society related). AND my Batman and Robin Society button. I remember having the Batman bubble bath dispenser and Batman hand puppet. I had the Colorforms kit too. Definitely agree with #13. I own the “Mars Attack” book and have always thought the Batman cards would be a natural. The advantage of the book is that the art is reproduced at a larger size than the cards. If they publishers can obtain the original negatives (which they did for “Mars Attack”) it will be a fabulous viewing experience. Great list! I have quite a few of the items listed here, but I wouldn’t mind seeing these back on the shelves! I had almost every one of those. 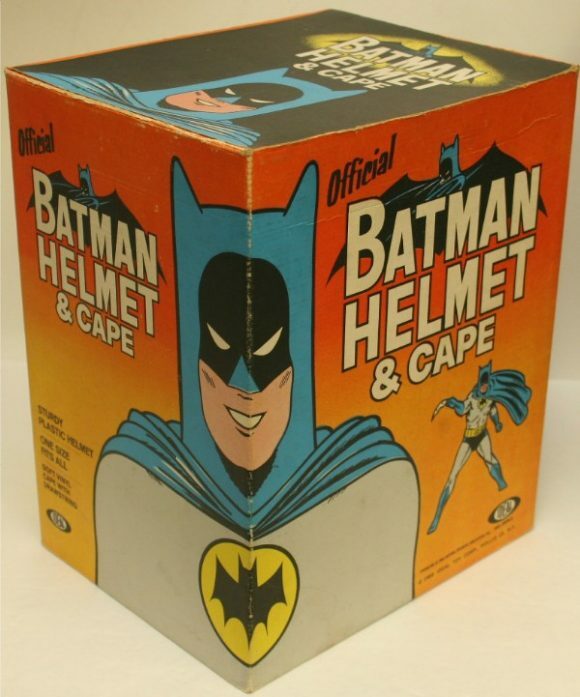 I know I didn’t have the helmet, but I had way more Batman merch than I recalled. I also has Batman Color Forms, a neck tie, model cars, I believe a Batman Aurora model, a large Batman plush toy, coloring book, pencils and erasers, plastic figures, sticker book, school book covers, glassware, and even bat sunglasses. I had a birthday party one year where almost every gift was Batman. Corgi Batmobile and Batboat! Couldn’t agree more. I used to wear that Batman costume as a kid, absolutely loved it! I would actually love to see more Batgirl items available as well! I have the 1966 Heritage Batgirl costume which was released a few years back and it is perfect! I have worn it a couple of times and it is always a hit!! I remember having a Batman jacket that had different images all over it in blue, red and yellow and black on a white background which I LOVED! It was sold as a ‘boy’s jacket’, but I didn’t care! I love the original Batman! 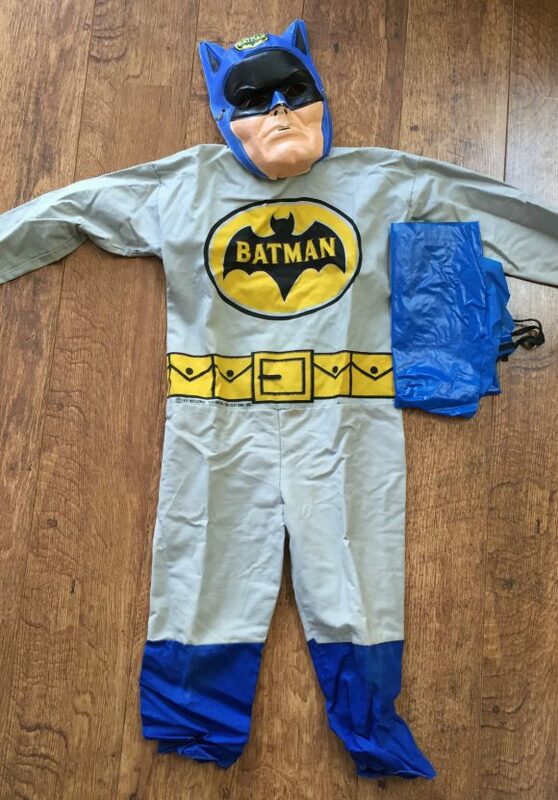 I just recently found my Batman hand puppet, but I sure would be over the moon to find that jacket! I had the Colorforms and the Ben Cooper costume in ’66, and the Aurora model of Batman and three-ring binder in the mid-70s. All are lost to the ages. I don’t have much room (or budget) for bat-loot these days, but it’s fun to see these goodies again. Thanks for the reminders. 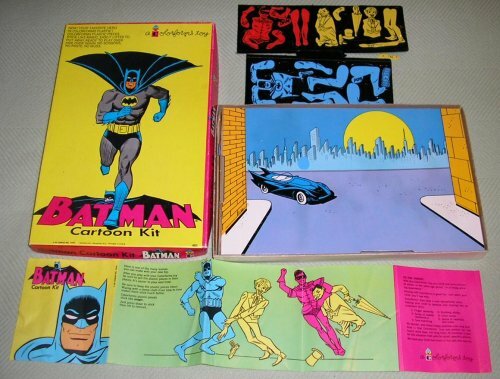 I still have my Batman colorforms set. Just like the one pictured here. One of the few things that survived my childhood. Corgis, and parachute Batman were part of my collection, but they are gone.